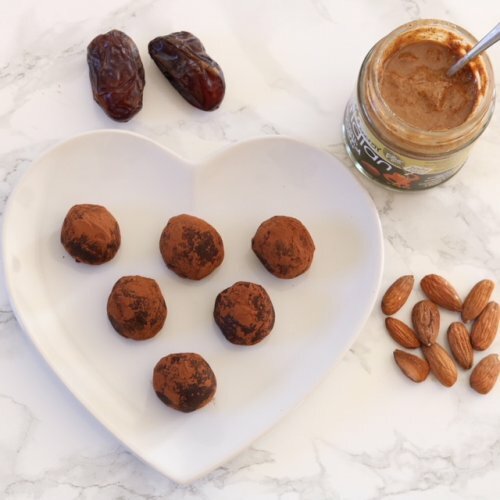 I love making these quick and easy nutty raw chocolate truffles. They are gluten, dairy and refined sugar free and are perfect for when you fancy something decadent that is sweet, rich and chocolatey. They also make great little gifts or after dinner treats with friends. Nuts are packed full with antioxidants and essential vitamins and minerals. The raw cacao contains flavanols, a compound that’s been proven to lower blood pressure and enhance circulation. A chocolate hit that nourishes mind, body and soul! Place the nuts and dates into a food processor and blend. Stir in the coconut oil (you may need to gently melt first to make this easier to work with), cacao or cocoa powder plus the almond or cashew nut butter and whizz together to make a thick gooey paste. With wet hands, roll into small balls and dust with a sprinkling of cacao or cocoa powder. Put onto a tray in the fridge for several hours to set (or freeze for half an hour to speed the process if you’re in a hurry). These also freeze well for storage, so you can always have some on hand!